Bringing an unprecedented degree of substance to SEO competition analysis, we're excited to announce the release of the SEO Monitor for a real and penetrating competitor insights experience. This new competition discovery tool goes beyond tracking the rank of a few of your competitors by offering you deep competitive insights. What truly sets this competition analysis tool apart is that it offers useful, genuine, and intelligible insights into how your competition approaches the SERP and their pursuit to push you off of it. The SEO Monitor, without any gimmicks or extravagant promises, gives you an avenue of insight towards analyzing how your competitors aim to claim dominance on the SERP. The SEO Monitor begins its journey towards providing you with comprehensive and actionable competitive insights with a breakdown of your top 20 SERP competitors. The tool's Competitor Rank Trends Graph tells you exactly who is giving you a run for your money on the SERP. With the graph you can see who your top 20 SERP competitors are at any point within the last 30 days on a per search engine, per keyword basis. With the graph, you can easily determine the ranking trends of your competitors making it possible to determine which competitor poses a real & lasting ranking threat. Further, you can isolate which of your competitors are showing an inconsistent ranking performance, and who are themselves having difficulty ranking on the SERP. The graph, via its hover function, allows you to easily hone in on a specific date to determine a single competitor's ranking, or that of all your competitors at once. This is certainly a lot of data to sift through. 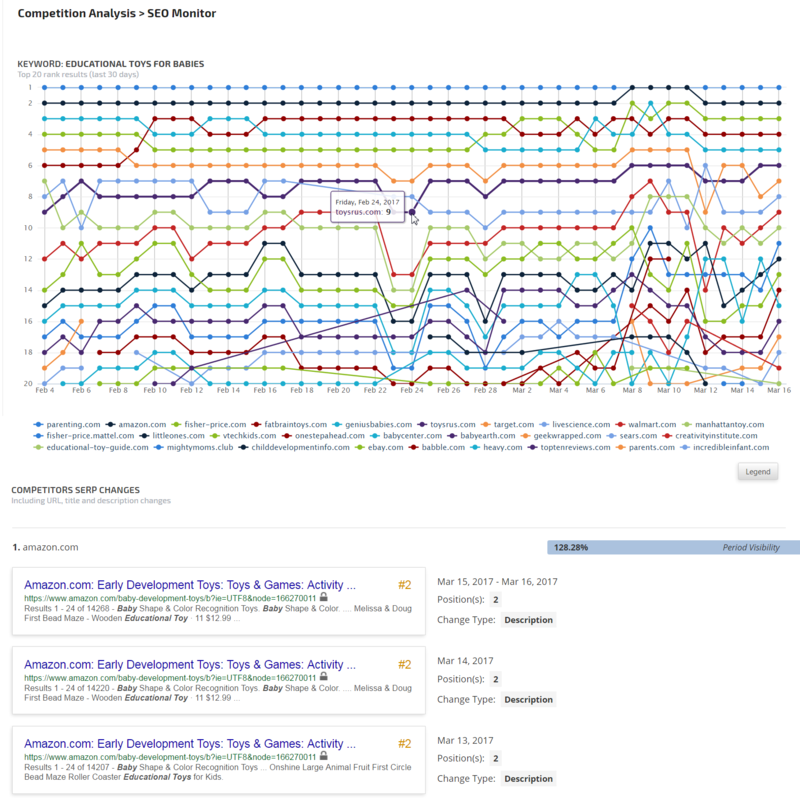 Recognizing this, you can set the Competitor Rank Trends Graph to show competitors in intervals of 5 (i.e. the top 5, 10, 15, or 20 competitors). Further, via the graph's legend, you can hide any of the listed competitors from showing. Meaning, after seeing what the competition field looks like, you can easily hone in on any specific competitor, or group of competitors, for a more targeted analysis. Competitor identification and trend analysis are only the beginnings of a true competition investigation. Seeing the rankings of your competitors answers the question of 'who', yet for a true analysis you need to understand 'what' your competition is doing. Simply put, what is it that your competition is doing so as to rank on the SERP as they do. To this extent, the SEO Monitor provides you with insight into the underpinnings of the competition's actual SERP results. Shown according to their current SERP rankings, the SEO Monitor displays the actual SERP result per competitor for the keyword represented within the tool. In other words, you can see exactly how each of your competitor's actual results looks like on the SERP. Each listing includes the title, page link, description, and SERP feature indicators that the result scored. Clicking on the link will in fact bring to you the page shown within the result. In fact, if a specific result has held various positions in the past 30 days, you can see how it actually appeared at each of step of its ranking journey. It's quite possible that any given competitor is ranking for multiple pages for the same keyword. Via the SEO Monitor's SERP changes tracking, you can easily see when a competitor is scoring a top 20 ranking for more than one page. The SEO Monitor will track each and every time a competitor displays a different page for the same keyword within the past 30 days. Not only can you see that a competitor has multiple pages ranking, but you can see each time within the last 30 days that they've done so. In other words, if say Google is alternating between two of a competitor's pages, you can track exactly when Google showed which page on the SERP. The SEO Monitor will show you the actual result for a competitor each time a new page shows on the SERP, even if that page has previously shown on the SERP within the last 30 days. So long as the page is not the same as the one previously shown on the SERP, the SEO Monitor will record the change. While seeing a competitor's alternating pages ranking for the same keyword offers insights into how a search engine may function, the SEO Monitor additionally allows you to peer into the very mind of your competition. Any time one of your competitors makes a change to a ranking page's URL, meta-title, or meta-description, you'll know about it. The SEO Monitor will show the new "version" of the ranking result, creating a living history of your competition's meta alterations. Meaning, if a competitor made repeated changes to a ranking page's meta-description, you will see each version in a per date order with a tag telling you that the change occurred within the description. As a result, the SEO Monitor actually affords you a way of "seeing under the SERP" and of understanding the thinking and strategy of your SERP competition. Being able to see a change-by-change evolution of your competition's meta structure presents you with the nuance needed to understand how your competition goes about ranking on the SERP. This is highly actionable information that you can utilize for your ranking strategy by either incorporating the very same sort of changes your competition has made, or by intervening to prevent such changes from being effective. Along the same lines as seeing the meta changes your competitors are making, the SEO Monitor enables you to track any changes in the Google SERP features as part of, or as consequence of, your competition's results on the SERP. Seeing this information can be significant in understanding how a user may perceive your results compared to your competition's results. Say for example, all of your competitors display on the SERP as an HTTPS site, whereas you show as HTTP. Even though you may rank higher than a certain competitor, it is possible that users are choosing the lower ranking result over your own as way of feeling more secure on the web. The same is true if say the competition is showing with SiteLinks or a Video Thumbnail, etc. Though you may outrank them on the SERP, a user may take greater notice of other sites simply because of the way they are visually enhanced via SERP features. As with your competition's meta changes, you can track any changes to the SERP features associated with a competitor's result. Here too, a new result will appear within the competitor's timeline each time that competitor has a page that either has gained or lost a SERP feature. The upshot here is that you can gain insight into what feature a competitor may be trying to target. More importantly perhaps, you can easily determine how strongly tied a specific SERP feature is to a result. This is highly pertinent information when looking to show on the SERP for features such as Featured Snippets. Should a competitor hold a result that throughout the 30 day period consistently showed with a Featured Snippet, you may decide not to dedicate efforts into usurping their above the results position. However, if by using the SEO Monitor you see a competitor's Featured Snippet showing fade in and out over the reporting period, you know that Google still hesitates to ascribe supreme authority to that result, leaving you room to target that above the top spot. To bring its in-depth competition analysis together, the SEO Monitor gives you insight into the overall strength of your competition's presence on the SERP. Accompanying each competitor within the Competitors SERP Changes portion of the tool is the Period Visibility score. The Period Visibility score gives you an easy and concrete way to determine the strength of your competition across the entire 30 day period. Any competitor who has ranked within the top 20 results will be shown with the Period Visibility score, even if they only ranked as such for a single day. With this, you have a total and complete view of your top ranking competition for the 30 day period. To such an extent, the SEO Monitor presents your competition within the Competitors SERP Changes section not according to current rank, but in sequence of Period Visibility score, thus making it overtly easy to determine which competitors have had the strongest 30 day SERP performance. Armed with behind the scenes ranking occurrence data, the SEO Monitor does anything but skim the surface of SEO competition analysis. With it you can transcend beyond the SERP and enter the conference room where your competition is planning their SEO strategy. By tracking every change to the URL, meta-title, and meta-description that your competition makes to a top 20 ranking page, you enter the inner-sanctum that is your competition's very mindset and strategic orientation. In this way, the SEO Monitor moves from surveying the competitive field to providing you with unique and highly actionable information, becoming a genuine tool for competition analysis. With it, you can see what your competition has done on the SERP and where it appears they are going. In a way it makes you a search engine results psychic, heading off the competition before they even make their next move.